Immigration is shaking up electoral politics around the world. What is causing the nativist fervor? Are immigrants the cause or merely a common scapegoat? In Blaming Immigrants, economist Neeraj Kaushal investigates the core causes of rising anxiety in host countries and tests common complaints against immigration. She finds that it is neither the volume nor pace of immigration but the willingness of nations to accept, absorb, and manage new immigration that is fueling disaffection. Kaushal demystifies common misconceptions about immigration, showing that the level of global mobility is historically typical; that most of the time and its unique features are replicated by many countries; and that proposed anti-immigrant measures are likely to cause suffering without deterring potential migrants. 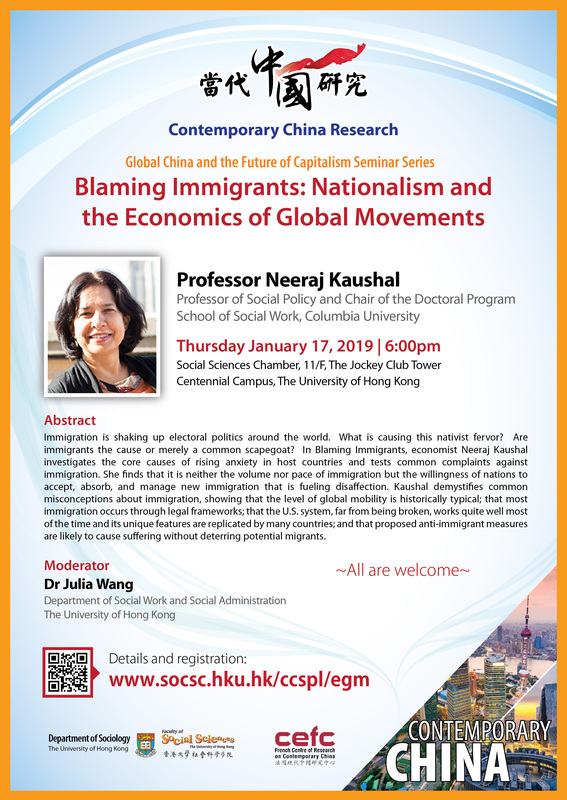 This seminar is the seventh of the “Global China and the Future of Capitalism Seminar Series” being held in 2018 and 2019. The concept note is available here.